I don't like the new Rainbow Brite design. It looks like they aged her up, which means they'll probably end up selling Rainbow Brite make-up to tweens. If she stays a cartoon for little girls who want to watch her go on adventures that don't involve the mall, I'll be very happy. I don't like the new Rainbow Brite design at all. Much like the new Strawberry Shortcake, they are thin and too hip looking. I like my cartoons looking like little kids I guess. AHHHH! No, no, no! 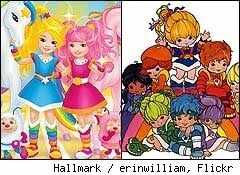 They ruined Rainbow Brite! Okay, I'll admit the horses look better. But not the people! I was a more a child of the 90s, but I did have a Rainbow Brite tape and I loved that thing to pieces. Jeez, everything from my childhood is comiing back. My Little Pony, Littlest Pet Shop, Polly Pocket... and not all for the better either. Maybe I'm just too attached to my childhood. Oh dear - must all of our 80s faves be raped and pilliaged? !